If you follow my blog, you already know I’m obsessed with K-beauty and all the secrets they have to offer. From essences, serums and exfoliants – I search and scour all the finest products from Korea to use on my face, neck and body. But did you know that us awesome Koreans not only follow a multistep skincare routine, but we also follow a multistep hair and scalp routine? But which products should you use, you wonder? Enter UMMA’S Good Day Hair of Seoul. If you don’t already know, “Umma” means mother in Korean. Therefore, the Umma brand is the mother of K-beauty and they nurture new K-beauty brands in the U.S. market. 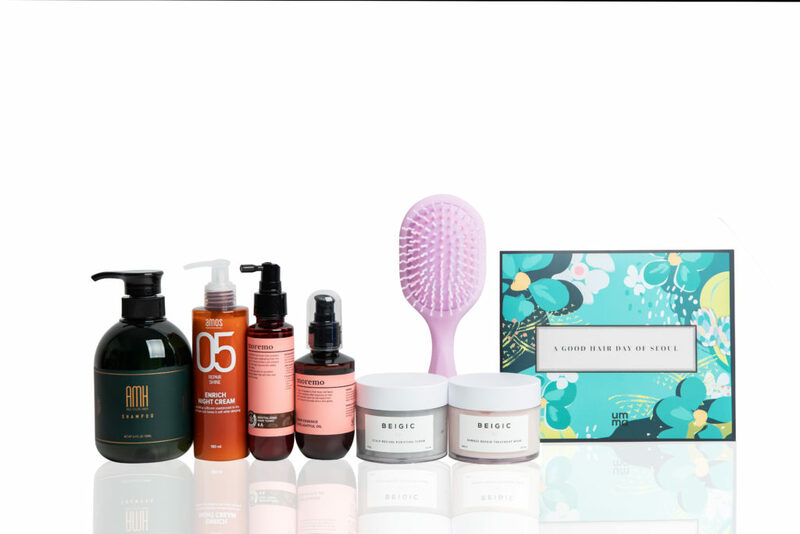 For the Good Day Hair of Seoul box specifically, they researched and tested over 50 products for over six months to find the best of the best products. Then they narrowed it down to the top 7 for you and me to use to achieve the best results for our hair and scalp health. The best part is that it’s sold at Costco and it’s only $99.99! This K-beauty curation box is quite the luxuriating experience. It makes my locks super shiny and soft – and I’m obsessed with the delicious smells! In this set are 7 amazing full-size products (6 of them are brand new to the US!) from Korea’s most sought after brands. WHAT EXACTLY ARE THE 7 AMAZING PRODUCTS? Listen up, party people. These 7 awesome products all do something different and are for different times of day. Some are to be used daily – and others weekly. We take skin care and beauty seriously! But don’t worry about getting confused about the which and the when. All the details are inside the box! 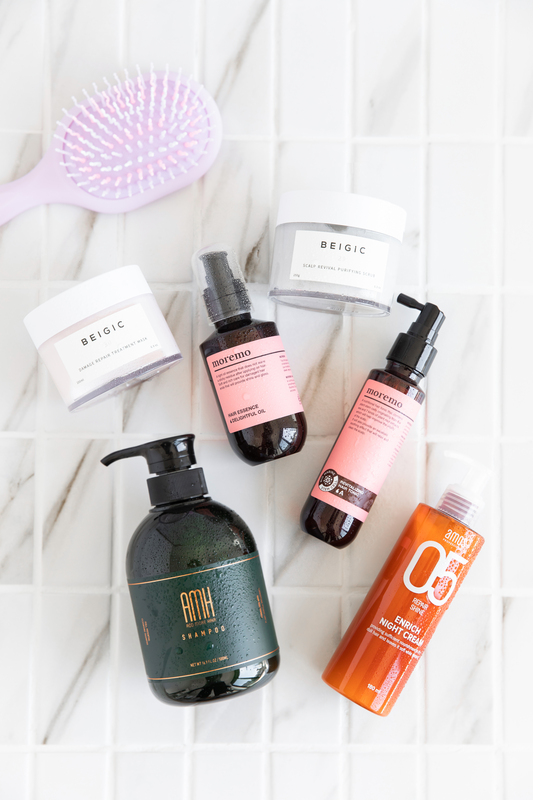 AMH (which awesomely stands for “Add More Hair”) was developed by doctors and contains ingredients that exfoliate the scalp, eradicate dandruff and boost general scalp health. I love massaging my scalp with this to make sure I reach the full potential of the product! This exfoliator and detoxifying shampoo may be my favorite! 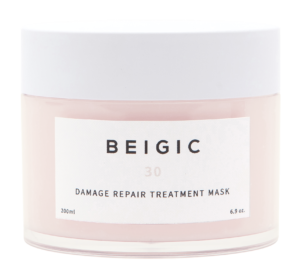 BEIGIC uses only clean and natural ingredients, with an emphasis on plant-based, food-grade and fair-trade sourcing. 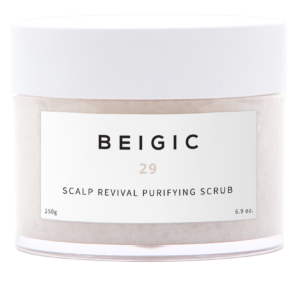 It’s enriched with sea salt, mint menthol and green coffee bean extract to deeply cleanse and remove dead skin, sebum builds up and impurities from scalp and hair. All that built up is gone and you get a new bounce, lightness and radiance to your hair! And the best part is that it’s free from drying alcohols, fragrance, dyes, synthetic preservatives and silicones. This is formulated with nourishing ingredients like green coffee bean oil, argan oil and rosehip oil and it prevents future damage and breakage! This is ideal for hair weakened by overexposure to the sun, chemical-processing, or frequent heat styling. This will especially come in handy over the summer after my hours in the pool and ocean. This tonic is a nutrient-rich, soothing tonic created with bio-marine stem cells, seven different plant root extracts and orange and bergamot essential oils. 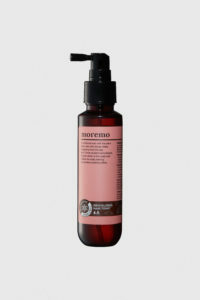 It cleanses the scalp and adjusts the water-oil balance for ideal hair health. Actually, I lie. 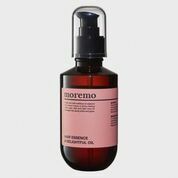 I can’t decide if this Moremo Hair Essence oil or the exfoliating shampoo (see above) are my faves of the bunch! This gets your hair glistening soft! This oil adds moisture to tired, dry hair with eight types of vegetable oils including brazil nut oil, olive oil, argan oil and avocado oil! I think I’m going to slip some into my children’s hair as this may be the best detangler on the planet! If you don’t already know, Amos Professional, the professional line from K-Beauty giant Amore Pacific, is the ultimate No.1 hair salon brand in Korea! I personally am obsessed with everything from Amore Pacific! 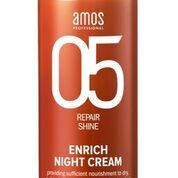 One of my favorite rituals at night is to go to hot yoga after work, take a shower the second I get home, and then apply the Amos Repair Shine Enrich Night Cream before bed. 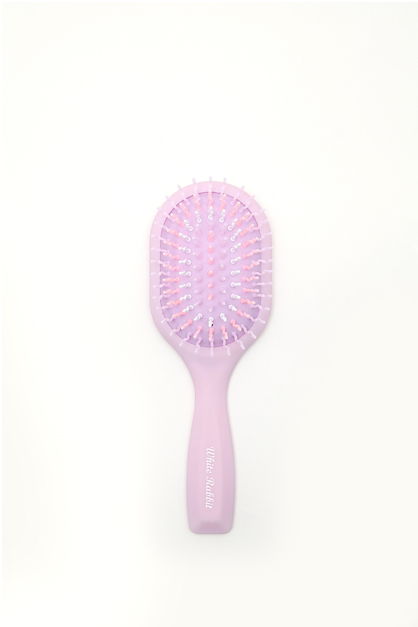 This adorable pink Volumizing Hair Brush adds volume and body, while easily detangling hair. The brush was carefully designed in Korea with patented S-shaped teeth that bends through hair to minimize damage. My girls keep trying to steal it from me though. It just takes one click. That’s the beauty of it. by ELAINESIR March 1, 2019 March 6, 2019 .
by ELAINESIR February 4, 2019 February 13, 2019 .
by ELAINESIR December 26, 2018 January 9, 2019 .
by ELAINESIR August 17, 2018 .
by ELAINESIR May 4, 2018 August 11, 2018 .